I am one of the many who benefitted from this site. I passed by PMP exam on 23/08/2010. I am one of the very few who has not studied Rita's PMP materials. I started my preparation from 3rd week of June'2010, every day 2 to 3 hours. I took one week leave just before exam i.e on 23/08/2010. On holiday, I used to study about 10 to 12 hours. 1) Head First by Jennifer Greene and Andre Stell man- Only once but it is very good for starters. 2) PMBoK-Once. I took couple of tests-results were not encouraging -about 50%. 3) Then ordered two more books from eBay a) PMP exam pass on first time by Andy Crowe and b) PMP exam review by Kim Heldman. Both are very good for simplicity and number of questions wise. 4) Then again I read PMBok one more time by which I could get clear concept of PMP exam. 5) Lately I ordered PMP exam book by Joseph Philips, I could not read fully, but I practiced questions in CD that come along with book which are also very nearer to exam. 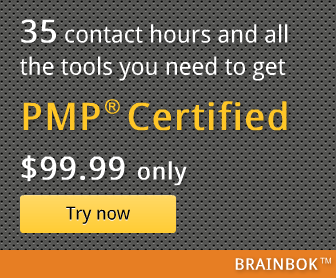 6) Valuable lessons learned from various successful PMP exam passed people. I thank this website with valuable inputs, otherwise passing PMP in first time would not have been possible. Ramakrishna - Thanks for sharing your lessons learned. I'm glad to be of help and happy to see you succeed.